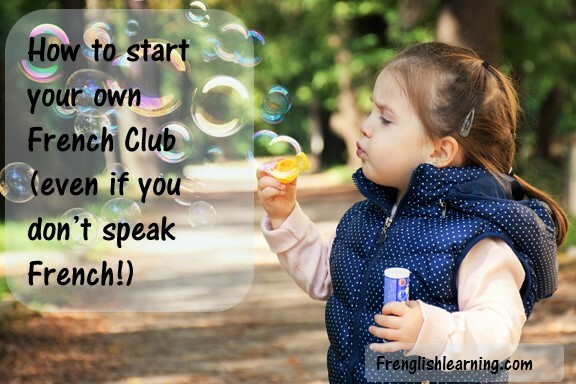 If you’re looking to shake up your regular routine a bit, early in the year can be a great time to start a French Club. What exactly is that and how do you pull it together without losing your mind? In a nutshell, a French club is a group that gets together on a regular basis to do something French-related. Depending on your goals, that can mean homework help, grammar teaching, activities that are specifically geared to a group dynamic, or anything else that you can come up with. When we had our French club, the activities were focused on things that work better in a group setting – skits, songs, games, and other hands-on activities. I figured it was easier to do worksheet-type stuff individually at home and use our time together for the fun stuff. That approach fit our group well. I would challenge you to look at the needs of your own group and decide what you’d like to focus on and communicate that clearly to everyone who is considering joining. You don’t want people showing up expecting one thing and getting another. Once you’ve decided what you’re going to focus on, it’s time to gather some ideas for activities that will help you get to your goal. If you’re focusing on homework help, then you’re going to need someone who is fluent enough to fill that need. Or, if you don’t speak French, you need to be really good on Google to find explanations of the questions so you can direct the children. Better yet, show them how to find answers to their questions using supervised internet searches. Looking up the answer is not cheating. On the contrary, the act of looking it up makes it more likely that they will remember the information in the future. If you’re looking for hands-on activities, please feel free to do a search on this blog – use the search bar in the right sidebar and type in “French club”. I ran a French club for about 3 years. We had about 8-10 students between the ages of 4 and 11, and had a great time. Each week had a theme, and all of our activities were related to that theme. Active game start – We’d start the time together with an active game to get some energy out. As an example, one week our theme was clothing. One mom brought a few bins of dress-up clothing. We set up the bins at different ends of my backyard (we live in the country so we have space, but you could do this at a park as well.) The children had to run to the bin, put on an article of clothing, name what they just put on in French to the adult standing at the bin, and then run back. We played a few variations where the kids would put on multiple items at once, or just one at at time. Reading time – After the active game, we moved into the living room for a short story on the theme. When our theme was clothing, the children were mostly at the beginner level, so I chose a book that had only a few words per page with lots of pictures. The look-and-find type books were always especially popular and gave great chances for interaction. If you don’t speak French, you could use an English book and choose specific words to say in French after reading them in English. Or, you could use a book with an audio CD. Check out Storyplayr for e-books in French with audio accompaniment. Verbal interaction – Once the story was finished, we would do an activity or game. Themed Bingo, card games, and battleship variations were always popular. Of course, special snacks that went with the theme were always a hit too. If you don’t speak French yourself, just pick out a few key phrases that you want everyone to say in French as you go and say everything else in English. The number of options available can get a little overwhelming. If you’re not sure where to start, I’d say just pick something and try it. If it doesn’t go well, do something else the next time. Are your children part of a French club, playgroup, or group class? This entry was posted in 4-6 years, 7-10 years, Beginner, Bilingual parent, Immersion, Intermediate, Other, Parent speaks no French, Parent speaks some French by Leanne. Bookmark the permalink.